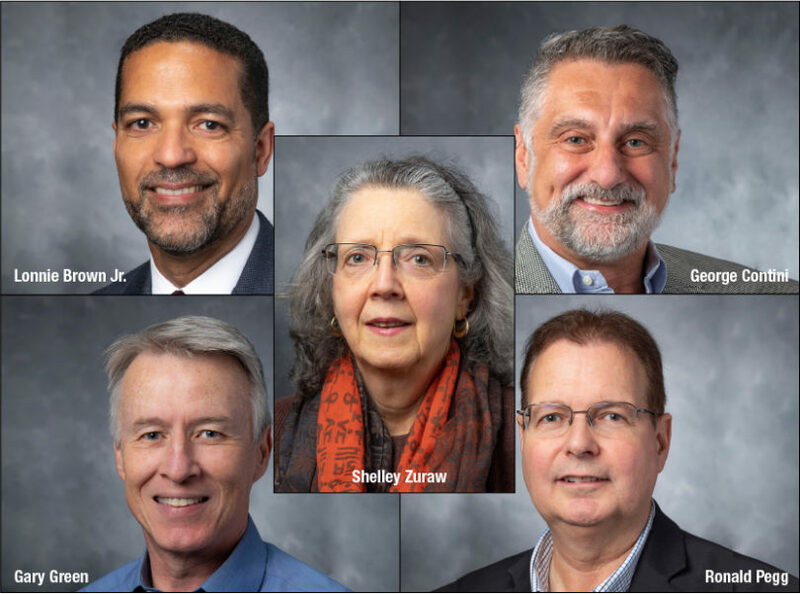 UGA’s 2019 Meigs Professors will be honored April 1 at the annual Faculty Recognition Banquet. Five University of Georgia faculty members have been named Josiah Meigs Distinguished Teaching Professors, the highest university recognition for excellence in instruction. Shelley E. Zuraw, associate professor of art in the Franklin College of Arts and Sciences. Brown animates his courses in civil procedure using examples from his own experience in practice as a commercial litigator prior to joining the School of Law faculty in 2002. Through case study and discussion, Brown’s lessons are designed to encourage students to look beyond a single circumstance to gain a deeper understanding of abstract topics, and he incentivizes students to apply their training by helping people and organizations in the community, such as the Northeast Georgia Food Bank. Brown, who previously served as associate dean for academic affairs, is a Senior Teaching Fellow and member of the UGA Teaching Academy and a recipient of the C. Ronald Ellington Award for Excellence in Teaching. He has received the Student Bar Association’s Professionalism Award 11 times. Contini creates a learning environment based in applied creative research, bringing his experience as a professional actor, director and playwright to his classroom and productions. He guides students through his specializations of characterization, acting on camera, solo performance and queer theatre in classes that are collaborative and experiential. He is head of the acting area of theatre and film studies and serves as director of the department’s London study abroad program. He has directed 16 mainstage University Theatre productions, operas for the Hugh Hodgson School of Music and overseen many undergraduate and graduate students’ creative activities and research. Contini, who joined the UGA faculty in 2001, is a member of the UGA Teaching Academy and a recipient of the Beaver Award and the Russell Award. Green teaches courses related to parks, recreation and tourism management, and seeks to ignite students’ interest and facilitate their learning through real-world examples and service-learning approaches. For example, students in his “Environmental Interpretation” course engage with natural resource agencies to apply their knowledge to present-day problems. Green also created an online version of the large, popular “Natural Resources Conservation” course that many faculty members use as a template for their own online courses. Green, who joined the faculty in 2004, has received awards from Xi Sigma Pi, a forestry honors society, the UGA Student Government Association and the Warnell School. He is a recipient of the Russell Award, a First-Year Odyssey Seminar Teaching Award, the Graduate School’s Outstanding Mentoring Award and a UGA Teaching Academy member. Pegg created a “virtual laboratory” funded by a UGA Learning Technologies grant to allow students to script, film and edit food analysis laboratory exercises; the ensuing ­videos then provide a tool to assist students with issues that might arise in an analysis. Pegg, who joined the UGA faculty in 2006, co-coaches the Institute of Food Technologists’ Student Association College Bowl Team, which won the National Championship in both 2010 and 2018. Pegg is a recipient of the Russell Award, and has received six teaching awards from the Food Science Club and in 2014 an inaugural First-Year Odyssey Seminar Teaching Award. In 2016, he received IFT’s prestigious William V. Cruess Award for excellence in teaching food science and technology as well as the North American Colleges and Teachers of Agriculture Educator Award. Zuraw joined the UGA faculty in 1993 and has designed and taught more than 30 courses in the history of Renaissance and Baroque art in the Lamar Dodd School of Art, including 15 writing intensive courses that help students learn and apply communication skills. In her former role as area chair for art history and as associate director of the Dodd School, Zuraw revamped the school’s art history offerings. She previously held the title of Sandy Beaver Teaching Professor, which is bestowed on the top instructors in the Franklin College. She is a member of the UGA Teaching Academy, earned a UGA Honors Program collaborative teaching grant and was named a Center for Teaching and Learning Senior Teaching Fellow. The Meigs Professorship was established to underscore the university’s commitment to excellence in teaching, the value placed on the learning experiences of students and the centrality of instruction to the university’s mission. The award includes a permanent salary increase of $6,000 and a one-year discretionary fund of $1,000. More information about the Josiah Meigs Distinguished Teaching Professorships is available at provost.uga.edu/resources/faculty-resources/professorships/josiah-meigs-distinguished-teaching-professorships/.